به منظور بررسی تأثیر نانو کودهای مختلف بر برخی صفات فیزیولوژیک زعفران، آزمایشی در قالب طرح بلوک­های کامل تصادفی با شش تیمار و سه تکرار در دانشگاه ملایر در سال زراعی 94-1393 انجام شد. تیمار­های آزمایشی شامل نانو کودهای تک عنصره­ی آهن، منگنز، بُر، پتاسیم، روی و شاهد بودند که با غلظت دو در هزار و به­صورت محلول­پاشی جهت بهبود وضعیت تغذیه گیاه مورد استفاده قرار گرفتند. نتایج به‌دست‌آمده نشان داد که اثر محلول­پاشی نانو کودها روی میزان محتوای نسبی آب، قند احیاکننده و قندهای غیر احیاکننده معنی­دار بود. نانو کودهای مختلف از نظر کلروفیل a و کلروفیل کل اختلاف معنی‌داری با تیمار شاهد نداشتند با این­وجود بیشترین میزان کلروفیل a (mg.g-1 Fw 53/1) در تیمار نانو کود آهن و کمترین میزان آن (mg.g-1 Fw 93/0) در تیمار نانو کود منگنز مشاهده شد. تیمارهای آزمایشی تأثیر معنی‌داری بر میزان کلروفیل b و آنزیم­های کاتالاز و پراکسیداز نداشتند. علاوه بر این تأثیر نانو کودهای مختلف بر میزان پروتئین و فنل معنی­دار بود. بیشترین میزان پروتئین (mg.g-1 Fw 56/1) در تیمارهای نانو کود پتاسیم و بُر با 12 درصد افزایش نسبت به شاهد مشاهده شد و کمترین میزان پروتئین برگ (mg.g-1 Fw 36/1) در تیمار نانو کود آهن به دست آمد که نسبت به تیمار شاهد سه درصد کاهش نشان داد. بیشترین میزان فنل (mg.g-1 Dw 27/0) با 5/10 درصد افزایش نسبت به شاهد در تیمار نانو کود منگنز مشاهده شد و فقط اختلاف این تیمار با شاهد معنی­دار بود. بر اساس نتایج این آزمایش به نظر می­رسد که کاربرد کلیه نانو کودهای مورد مطالعه با غلظت یکسان از لحاظ علمی قابل توصیه نیست. Akrami, M.R., Malakouti, M.J., and Keshavarz, P. 2014. Study of flower and stigma yield of saffron as affected by potassium and zinc fertilizers in Khorasan Razavi Province. Journal of Saffron Research 2 (1): 85-96. (In Persian with English Summary). Al-Bishri, W., and Nabil Danial, E. 2013. Comparative study on the antioxidant, antimicrobial activities and total phenolic content of selected seeds from Saudi Arabia. Journal of Food, Agriculture and Environment 11 (2): 202-207. Alscher, R.G., Erturk, N., and Heath, L.S. 2002. Role of superoxide dismutases (SODs) in controlling oxidative stress in plants. Journal of Experimental Botany 53 (372): 1331-1341. Amirghasemi, T. 2001. Saffron, Red Gold of Iran. 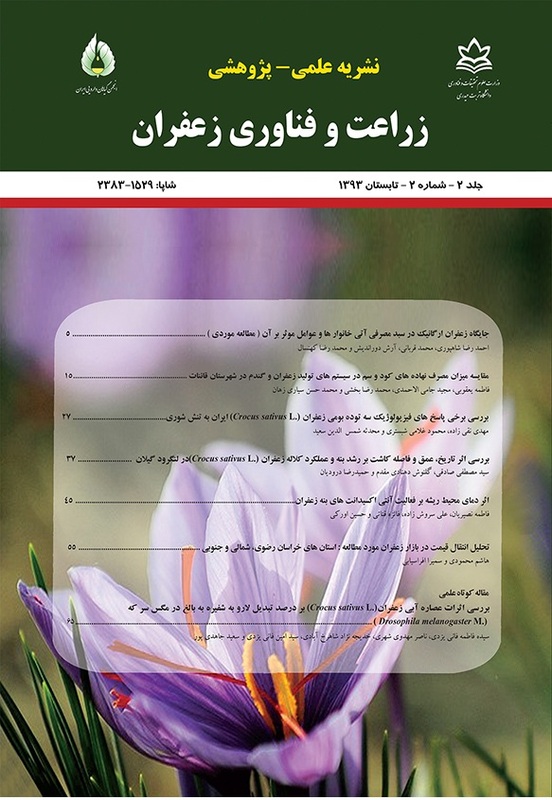 Ayandegan Publication. Tehran. (In Persian). Arif, M., Asifshehzad, M., Bashir, F., Tasneem, M., Yasin, G., and Iqbal, M. 2012. Boron, zinc and microtone effects on growth, chlorophyll contents and yield attributes in rice (Oryza sativa L.) cultivars. African Journal of Biotechnology 11 (48): 10851-10858. Athar, H., and Ashraf, M. 2005. Photosynthesis under drought stress. In M. Pessarakli (eds). Handbook of Photosynthesis. CRC Press, New York. p. 795-810. Babaeian, M., Haydari, M., and Ghanbari, A. 2009. Effects of foliar micronutrient application on osmotic adjustments, grain yield and yield components in sunflower (Alster cultivar) under water stress at three stages. Journal of Water and Soil Science 12 (46): 119-129. (In Persian with English Summary). Bannister, J.V., Bannister, W.H., and Rotills, G. 1987. Aspects of the structure, function and application of superoxide dismutase. CRC Critical Reviews in Biochemistry 22: 110-180. Benlloch-Gonzalez, M., Arquero, O., Fournier, J.M., Barranco, D., and Benlloch, M. 2008. K+ starvation inhibits water stress- induced stomatal closure. Journal of Plant Physiology 165: 623-630. Bradford, M.M. 1976. A rapid and sensitive method for the quantitation of microgram quantities of protein utilizing the principles of protein-dye binding. Analytical Biochemistry 72: 248-254. Bybordy, A., and Mamedov, G. 2010. Evaluation of application methods efficiency of zinc and iron for canola (Brassica napus L.). Notulae Scientia Biologicae 2 (1): 94-103. Curie, C., and Briat, J.F. 2003. Iron transport and signaling in plants. Annual Review of Plant Biology 54: 183-206. Dubois, M., Gilles, K., Hamilton, A., Rebers, J.K., and Smith, P.A.F. 1956. Colorimetric method for determination of sugars and related substances. Analytical Chemistry 28 (3): 350-356. Fanaei, H.R., Galavi, M., Kafi, M., and Ghanbari Bonjar, A. 2009. Amelioration of water stress by potassium fertilizer in two oilseed species. International Journal of Plant Production 3 (2): 41-54. Fathi Amirkhiz, K., Amini Dehaghi, M., Modares Sanavy, S.A.M., Rezazadeh, A.R., and Heshmati, S. 2011. Effect of iron application on enzymatic activity, grain yield and oil content of safflower under water deficit conditions. Iranian Journal of Crop Sciences 13 (3): 452-465. (In Persian with English Summary). Fathi Amirkhiz, K., Amini Dehaghi, M., and Heshmati, S. 2015. Study the effect of iron chelate on chlorophyll content, photochemical efficiency and some biochemical traits in Safflower under deficit irrigation condition. Iranian Journal of Field Crop Science 46: 137-145. (In Persian with English Summary). Gogorcena, Y., Iturbe-Ormaetxe, I., Escuredo, P., and Becana, M. 1995. Antioxidant defenses against activated oxygen in pea nodules subjected to water stress. Plant Physiology 108: 753-759. Grotz, N., and Guerinot, M.L. 2006. Molecular aspects of Cu, Fe and Zn homestasis in plants. Biochemistry and Biophysica Acta 763 (7): 595-608. Hajiboland, R., and Amirazad, H. 2010. Drought tolerance in Zn-deficient red cabbage (Brassica oleracea L. var. capitata f. rubra) plants. Horticultural Science 37: 88-98. Khodary, S.E.A. 2004. Effect of salicylic acid on the growth, photosynthesis and carbohydrate metabolism in salt stressed maize plants. International Journal of Agriculture and Biology 6: 5-8. Khorasani, R., Rezvani Moghaddam, P., and Hassanzadeh Aval, F. 2013. Effect of concentration, time and frequency of foliar applications on vegetative growth and production of replacement corms of saffron (Crocus sativus L.) by using a complete nutrient solution. In Second National Conference on the Newest Scientific and Research Findings on Saffron. Torbat-e- Heydarieh. Iran, 30 October 2013, p. 40. (In Persian). Lichtenthaler, H., and Wellburm, A.R. 1983. Determination of total carotenoids and chlorophyll a and b of leaf extracts in different solvents. Biochemical Society Transactions 603: 591-593. Marschner, H. 2011. Mineral nutrition of higher plants. 3rd ed. Academic Press. McDonald, S., Prenzler, P.D., Autolovich, M., and Robards, K. 2001. Phenolic content and antioxidant activity of olive extracts. Food Chemistry 73:73-84. Mittler, R., Vanderauwera, S., Gollery, M., and Breusegem, F.V. 2004. Reactive oxygen gene network of plants. Trends in Plant Science 9: 490-498. Moeinian, M.R., Zargari, K., and Hasanpour, J. 2011. Effect of boron foliar application on quality characteristic and growth parameters of wheat grain under drought stress. American-Eurasian Journal of Agricultural and Environmental Sciences 10 (4): 593-599. Morshedi, A., Malakouti, M.J., and Rezaei, H. 2001. Effect of iron foliar application on yield, quality and quantity characteristic and enrichment of canola grains in Bardisar, Kerman. Journal of soil and water 12: 56-68. (In Persian). Mukhopadhyay, S.S. 2014. Nanotechnology in agriculture: prospects and constraints. Nanotechnology, Science and Applications 7: 63-71. Nelson, N. 1944. A photometric adaptation of the somogyi method for the determination of glucose. The Journal of Biological Chemistry 153: 375-380. Peivandi, M., Kamali Jamakani, Z., and Mirza, D. 2011. The Effect of Nano Fe Chelate and Fe Chelate on the Growth and Activity of some Antioxidant in summer savory (Satureja hortensis). New Cellular and Molecular Biotechnology Journal 5: 25-32. (In Persian with English Summary). Peivandi, M., Parandeh, E., and Mirza, D. 2011. The effect of nano iron chelated with iron chelate on growth parameters and activity of antioxidant enzymes Basil (Ocimum basilicum). New Cellular and Molecular Biotechnology Journal 4: 89-98. (In Persian with English Summary). Qasim, M., Ashraf, M.M., Jamil, A.M., Rehman, Y.S.U., and Rha, E.S. 2003. Water relations and gas exchange properties in some elite canola (Brassica napus L.) lines under salt stress. Annals of Applied Biology 142 (3): 307-316. Ranieri, A., Castagna, A., Baldan, B., and Soldatini, G.F. 2001. Iron deficiency differently affects peroxidase isoforms in sunflower. Journal of Experimental Botany 52 (354): 25-35. Rostami, M., and Ahmadi, A.R. 2014. Investigation the effect of nitrogen forms and split fertilization on grain yield and nitrogen content of two corn hybrids. Agronomy Journal (Pajouhesh & Sazandegi) 10: 40-46. (In Persian with English Summary). Rostami, M., and Mohammadi, H. 2013. Effects of planting date and corm density on growth and yield of saffron (Crocus sativus L.) under Malayer climatic conditions. Journal of Agroecology 5: 27-38. (In Persian with English Summary). Shafea, L. Saffari, M., Emam, Y., and Mohammad Nejad, Gh. 2011. Effect of nitrogen and zinc fertilizers on leaf zinc and chlorophyll contents, grain yield and chemical composition of two maize (Zea mays L.) hybrids. Seed and Plant Production Journal 27 (2): 235-246. (In Persian). Shigeoka, S., Ishikawa, T., Tamoi, M., Miyagawa, Y., Takeda, T., Yabuta, Y., and Yoshimura, K. 2002. Regulation and function of ascorbate peroxidase isoenzymes. Journal of Experimental Botany 53 (372): 1305-1319. Sun, B., Jing, Y., Chen, K., Song, L., Chen, F., and Zhang, L. 2007. Protective effect of nitric oxide on iron deficiency-induced oxidative stress in maize (Zea mays). Journal of Plant Physiology 164: 536-543. Tavallali, V., Rahemi, M., Maftoun, M., Panahi, B., Karimi, S., Ramezanian, A., and Vaezpour, M. 2009. Zinc influence and salt stress on photosynthesis, water relations, and carbonic anhydrase activity in pistachio. Scientia horticulturae 123 (2): 272-279. Welch, R.M.1995. Micronutrient Nutrition of Plants. Critical Reviews in Plant Sciences 14: 49-82. Zabihi, H.R., and Feizi, H. 2014. Saffron response to the rate of two kinds of potassium fertilizers. Saffron Agronomy and Technology 2 (3): 191-198. (In Persian with English Summary). Zare Dehabadi, S., Asrar, Z., and Mehrabani, M. 2008. Effect of zinc on growth and some physiological and biochemical parameters of spearmint (Mentha spicata L.). Iranian Journal of Plant Biology 20 (3): 230-241. (In Persian with English Summary). Zhu, H., Han, J., Xiao, J.Q., and Jin, Y. 2008. Uptake, translocation and accumulation of manufactured iron oxide nanoparticles by pumpkin plants. Journal of Environmental Monitoring 10: 713-717.